Four volumes bringing together the most influential and foundational works in Transitional Justice, edited by Kieran McEvoy and Louise Mallinder. Published by Routledge. Chapter by Kieran McEvoy, Ron Dudai and Cheryl Lawther in A. Liebling et al (eds.) Oxford Handbook of Criminology 6th Edition, Oxford University Press, 391-416. The Research Handbook is extensive in scope, with chapters discussing the concepts, actors, mechanisms and practices of transitional justice. They address the challenges of implementing a range of transitional justice mechanisms, including methods of truth recovery, criminal trials and reparation and lustration programmes. 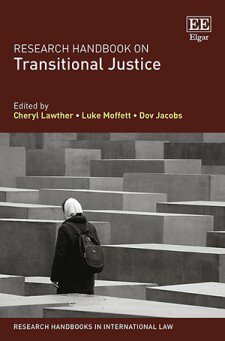 Going a step further, this book also expands the gaze of transitional justice to include underexplored areas, such as art and transitional justice, media and transitional justice and unique international case studies, such as Cambodia and Palestine. Timely and thought provoking, the Research Handbook on Transitional Justice will be of interest to both scholars and students, particularly those working in the areas of transitional justice and peace-building. It will also prove a valuable reference tool for practitioners of transitional justice and international criminal justice, helping to inform best practice. You can read the Introduction to edited collection here.